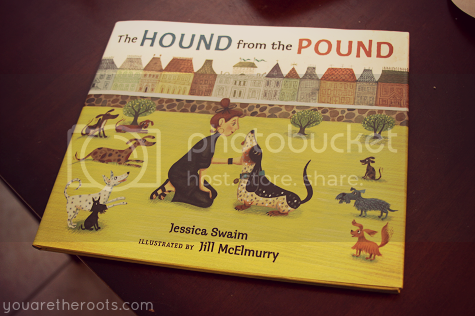 Parents, teachers, animal lovers, people who simply know someone with a child -- allow me to introduce you to Jessica Swaim's masterpiece, The Hound from the Pound. We read a lot of books in this house. Sometimes it's the same story over and over again that Ethan just can't get enough of. This happens when one book particularly enthralls him, be it the illustrations or the catchy storyline. We've been going to the library for a few weeks now, Ethan browsing and selecting any book that interests him that he'd like to check out. More often than not, he chooses books about animals. Dogs? Cats? Birds? Otters? If there is an animal anywhere on the cover, chances are he's shrieking with excitement while the librarian offers a reminder to shhhh. I love that my child loves to read. I love the way he hurls his thirty-pound body onto my lap and taps his knees with excitement at the anticipation of storytime. I love his enthusiasm for reading animal stories or chasing our cats around the house while wielding books with cats on the cover as if it's going to impress them. What I don't love? Some of these stories out there geared for children. Sometimes these books will flat-out confuse me. And what were we reading about again? 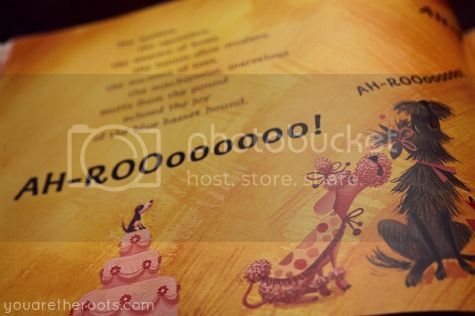 Sometimes there really isn't any storyline at all, I'm sure of it, just random words being strewn together alongside brightly colored pictures for the thrill of calling it a children's book. We've checked out some duds from the library, that's for sure, but we've also discovered some gems. When we find a book that we truly love, with a story that sparkles and touches your heart and illustrations that you can't help but run your finger over, well, it's a great feeling for a couple of literature buffs. 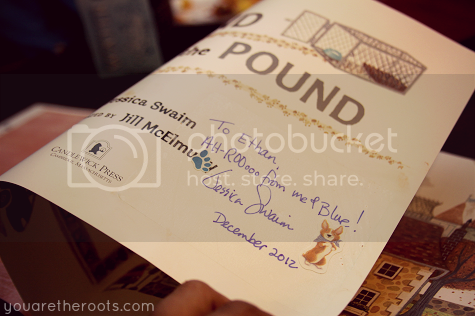 The time we discovered Jessica Swaim's The Hound from the Pound was one of those times. I'm about to make a broad statement, one you can't make lightly. Are you ready? Okay, here it is: this is the most well-written children's book I can recall ever reading. It's a beautiful story told in the most impeccable rhyme, one that flows so smoothly that Ethan even dances as we read the story, tapping his hands upon his knees or shaking his wrists in the air to the rhythm. On the surface, it's a sweet story to begin with: a lonely woman adopts a dog and ends up with a house full of chaos and more dogs than she can handle. Miss Mary Lynn Macintosh calls for Sam the canine trainer to save the day, setting the pace for a happy ending all around. As an animal lover, I obviously love the emphasis this book puts on pet rescue and adoption. As a pet lover who is also a parent, I love the underlying message in the story: you can teach an old dog new tricks. You don't just give up on those you care about. You can find the beauty in everyone and work together. This book teaches these lessons without shoving it down your throat and taking away from the sweet, peppy story and rhyme. It's an endearing story you can't help but love and one that you cant help but find your heart melting while reading. Ethan and I are helplessly head-over-heels for Blue the basset hound and all of the other mischievous, marvelous mutts from the pound! Also, don't be surprised your child starts barking at and shouting ah-roooooo each time they pass a dog. It happens. Today Ethan started barking at one of my mom's neighbors who was walking her dog. She started walking faster and faster until she was almost jogging away. "Maybe she's in a rush," my mom sympathetically said. "Ah-roooooo!" Ethan called out after her. Yeah. A rush. We'll go with that. Because I'm not just stopping at the good news that such a special, beautifully written treasure of a book exists for children, I'm going to go one further: The Hound from the Pound is currently selling for only $10.87 on Amazon for a hardcover. I'm constantly getting asked for book recommendations from parents wanting their children to read more, wanting them to fall in love with a book. People are always asking for book recommendations to give as gifts to those they love. This is my new go-to. This is a story that parents and children alike will fall in love with. Just wait. You'll be smitten with Blue, too. 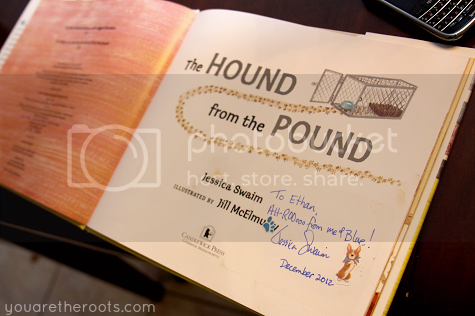 TO BUY:The Hound from the Pound by Jessica Swaim at Amazon, $10.87 for a hardcover.